Wonderful album from this Mexican icon! Yes, I said icon because Jose Luis Fernández Ledesma is a pillar in the Mexican progressive rock scene. We (who are familiar with this scene) know that in spite of the fact that he is not really that recognized, or even well-known, he is a talented man who has been working for several years, creating high-quality music that should be better known and of course recognized. My work here is to give him back a little bit of what he has done, so I hope my words help. Fernández Ledesma is known for his musical skills, he is capable of playing (well) several instruments, also for creating wonderful atmospheres in his music, which is a combination of symphonic music with avant-garde. 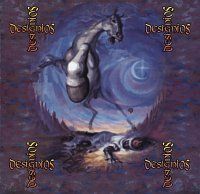 In 2003 he released this great record entitled "Designios", an album that consists on seven compositions that make a total time of 56 minutes of excellent Mexican prog rock. For his solo albums, he also recruited Margarita Botello, a talented singer who later would be part of Saena, another excellent band. Well, now let's get back to Designios. It is worth mentioning that Ledesma pays tribute to his former band Nirgal Vallis with a couple of tracks here: "Abismo" and "Los Designios de Géminis". So the album opens with "Ave Luz", a great opener track for a great album. Botello's voice is charming and sweet, while Ledesma´s guitar creates wonderful atmospheres accompanied by delicious percussions, and brilliant winds (all played by Ledesma himself). "Muro Ciego" is the shortest composition, but colorful and rich nonetheless. From the first seconds we can listen to a Sastur, an instrument that I like a lot. The atmosphere is a bit weird, it keeps a repetitive sound while Botello is delicately singing, and it continues until it finishes, but the thing is that while the seconds pass, new elements not easy to perceive are sounding and adding their grain of sand. "Saena" is the name of the third song, and also the name that Ledesma and Botello used to create this band I told you about earlier. This is the first song with guest musicians - one of them is Alejandro Sánchez (later member of the so called Saena) on violin. This song starts with a complete symphonic sound due to the keyboards, however later it turns folkish and prints different images with several colors. The percussion sound is fantastic, and all the instruments together transport us to another land, and maybe another era. The song is little by little building a structure, it is like reading a novel, I foresee what's next and open my mind to it. Wonderful song! "Canción para un solo día" is another great track that really shows Fernández Ledesma's skills and quality as a composer and performer. The rhythm is beautiful, a charming and pleasant sound is shared through the track, and this can be heard after three minutes with the appearance of a cello, making an even more solid song. I like the final minute and how the music seems to be fading out, when all of a sudden it arises. A wonderful folk sound is evoked in "Abismo". The use of maracas and acoustic guitar makes it evident. Also there is a great clarinet sound that interplays with violin. Just before the third minute, the song becomes stronger due to the keyboard sound and drums that create a fabulous piece of art. When you listen to a song like this, you cannot hide your satisfaction because, believe me, this is really a first-class track. Was I talking about first-class music? Then wait and listen to this 18-minute epic called "Los designios de Géminis", which will leave you speechless. In this song you will find a considerable amount of sounds, colors, textures, skins, nuances, images, etc. It is that kind of song in which you can have a complete trip around the world, I mean, you are moving while the music sounds, your mind is secretly travelling through the notes and accompanying these designios (designs). Let the music flow, let it rule and take your senses, let it do what it wants to you, and when it finishes, you will feel deeply pleased, satisfied, loved. There is a vast number of adjectives that a song like this can have, but well, after all, this is only me. It is subjective, but I bet you will understand my position once you carefully listen to it. (Actually, once you listen to this whole album). The album finishes with "Punta Cometa", a song that starts like a deep dream, a minute later the dream is over, time to wake up, so a new day is coming. The acoustic guitar sound is great and perfectly works together with Botello's beautiful voice, creating a charming atmosphere. The song is progressing while the minutes pass, though this time there are no noticeable changes, it is evident that different elements are being added little by little. What a wonderful album, I am not wrong if I say it is one of the best Mexican albums ever, or at least, one of the best of those which I have listened to. So please people, take a listen to Jose Luis Fernández Ledesma and especially to this gem. You will not regret it. So my final grade is five stars out of five, and it feels good!